Opioids have traditionally been the cornerstone for pharmacotherapy in the management of postoperative pain. However, we often face the situations where monotherapy using opioid alone is inadequate.,, Administration of high doses of opioids can result in higher incidence of complications such as respiratory depression, sedation, vomiting, constipation, pruritus, immune dysfunction, and urinary retention. We, therefore, in our study, wanted to explore the opioid-sparing effect of a combination of nonopioid drugs with different mechanisms of action, all having established effect on postoperative pain, and hypothesized that this “protective” package of nontraditional analgesics and antihyperalgesic drugs would demonstrate additive and prolonged postoperative analgesia and, consequently, significantly reduced intraoperative and postoperative opioid requirements and pain scores. This study was a prospective, randomized, double-blinded study conducted after obtaining Institutional Ethical Committee clearance and the patient's consent. We enrolled 100 patients with the American Society of Anesthesiologists (ASA) Grades 1 and 2, aged between 18 and 60 years, scheduled to undergo elective abdominal surgery under general anesthesia. Those who did not give consent, of age <18 years or >60 years, of ASA Grades 3–5, suffering from central nervous system disorders, having chronic pain conditions, and had taken analgesics in the past 48 h were excluded from this study. Patients were randomly divided into two groups (Group P and Group PK) using computer-generated random sequence of numbers with each group containing 30 patients. The patients in both groups received 150 mg of oral pregabalin 2 h before induction of anesthesia. Two syringes were prepared by an anesthesiologist not involved in the evaluation of the patients. According to the randomization assignment, these syringes were filled with ketamine solution (5 mg/ml) or saline 0.9%. Investigators involved in patient management or data collection were unaware of the group assignment. 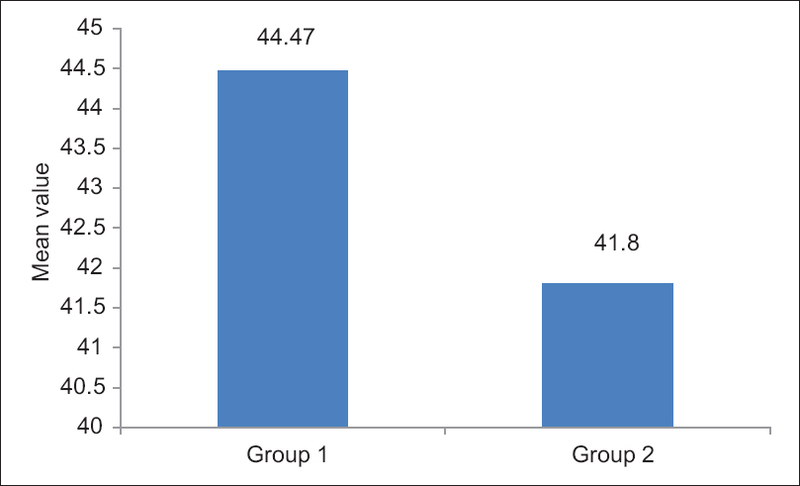 Patients in Group PK received injection ketamine (0.15 mg/Kg), whereas Group P received injection normal saline just before induction of anesthesia. All the patients were kept fasting for 6 h for solids and 2 h for clear fluids before surgery, and they received general anesthesia following a standardized protocol. Induction was carried with injection propofol 2.0 mg/kg body weight and injection fentanyl 2.0 μg/kg body weight intravenous (IV). After giving injection vecuronium bromide 0.1 mg/kg body weight IV and ventilating the patient with oxygen and nitrous oxide for 3 min, intubation was facilitated with cuffed oral endotracheal tube of the appropriate size for airway management, and anesthesia was maintained with isoflurane and nitrous oxide in oxygen with controlled ventilation using circle system to keep end-tidal carbon dioxide between 35 and 40 mmHg. Additional fentanyl was given as deemed necessary by the attending anesthesiologist. At the end of surgery, the patients were extubated on the table following reversal of neuromuscular blockade. Vitals such as heart rate and mean blood pressure (MBP) were recorded before induction, after induction, after intubation, after surgical incision, and after extubation. After surgery, heart rate and MBP were observed and recorded every hour for the first 6 h and then at 12 h and 24 h postoperatively in the ward. Furthermore, the time to first analgesic demand, VAS score, and total postoperative analgesic requirement were recorded. Pain was assessed by VAS. Patients were asked to place a mark from 0 to 10 to describe the intensity of pain with 0 taken as no pain and 10 as worst possible pain. Patient-controlled analgesia (PCA) was provided as rescue analgesia. Morphine in dose of 0.03 mg/kg was used in IV PCA pump with no basal flow. Whenever required, patient can self administered a bolus of 0.5 ml. A next bolus dose can only be administered after a lockout time of 15 minutes. Sedation was assessed at 1, 15, 30, and 60–120 min postoperatively using Ramsay Sedation Score. Side effects such as respiratory depression (respiratory rate <8/min or arterial oxygen saturation <90%), nausea, vomiting, lightheadedness, dizziness, vertigo, and diplopia were also recorded. The primary objective of this study is to observe the effect of preemptive pregabalin and pregabalin with IV ketamine on cumulative analgesic requirement postoperatively. Sample size calculation was based on mean morphine consumption. A clinically significant morphine-sparing effect was considered to be 15 mg over 24 h. According to the previous data (mean [standard deviation (SD)]: 38(19) mg) and for α-risk of 0.05 with a power of 80%, 26 patients per group were necessary. To account for dropouts, we planned to include 30 patients per group. The descriptive statistics for quantitative variables is presented in mean and SD. For qualitative variables, the data are presented in terms of frequencies along with respective percentages under different categories. The Chi-square test was used to compare the categorical variables. The unpaired t-test was used to compare the continuous variables between the groups across the time periods. The repeated measure of analysis of variance was used to compare the changes in the continuous variables over the time periods with interaction of time and groups. P < 0.05 was considered significant. All the analyses were carried out on SPSS 16.0 version (IBM, Inc., Chicago, IL, USA). A total of 60 patients scheduled to undergo abdominal surgery were included in this study [Figure 1]. The two groups were comparable on demographic data [Table 1]. Mean heart rate intraoperatively was found to be lower in Group PK as compared to Group P at different time intervals with significant difference before induction (mean: 85.37 ± 11.86 vs. 92.33 ± 11.21, P = 0.02), after surgical incision (mean: 73.43 ± 5.74 vs. 79.07 ± 4.57, P = 0.0001), and after extubation (mean: 80.43 ± 5.96 vs. 85.60 ± 6.33, P = 0.002). MBP intraoperatively in Group PK was found to be lower at all time intervals as compared to Group P. The MBP after surgical incision was found to be significantly lower in Group PK than Group P (mean: 75.07 ± 6.22 vs. 78.30 ± 6.20, P = 0.04). In Group P, the mean total analgesia requirement in postoperative period was 44.47 ± 5.06 mg, whereas in Group PK, it was 41.8 ± 2.34 mg, which was statistically significant (P = 0.006) [Table 2] and [Figure 2]. The time to first analgesic demand was found to be insignificantly (P = 0.91) higher in Group P (17.81 ± 3.95) than Group PK (17.69 ± 4.63) [Table 3]. Mean VAS score in Group P was observed to be higher in initial postoperative hours as compared to Group PK, while in later, postoperative hours mean VAS score was found to be higher in Group PK. There was no statistically significant difference in VAS score at all the time periods between the groups. There was no significant difference in side effects between the groups at all the time periods. Despite the considerable advances which have been made in the management of perioperative pain, a significant proportion of surgical patients still suffer from inadequate pain control. A multimodal analgesic regimen should be adjusted keeping the needs of the individual patient in consideration such as their preexisting medical conditions, types of surgery, and previous experiences related to both acute and chronic pain management. There is a lack of consensus with regard to the ideal opioid-sparing multimodal analgesia regimen. Pregabalin binds to the α-2-δ subunit of voltage-gated calcium channels, reducing the release of several excitatory neurotransmitters and blocking the development of hyperalgesia and central sensitization., Ketamine produces antinociceptive actions via inhibition of NMDA receptors and activation of descending inhibitory monoaminergic pain pathways. NMDA receptor-mediated spinal reflexes are intimately involved as the pharmacological basis for windup, which contributes to neuropathic pain. Ketamine prevents this pain associated with windup., Various studies are done to show the opioid-sparing action of pregabalin and ketamine when given preemptively but fewer data available on combination of these two drugs. 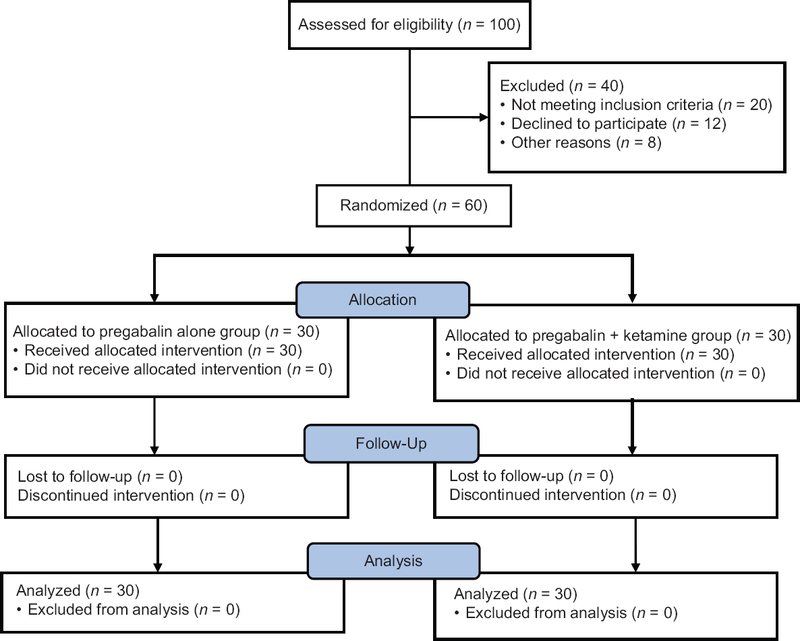 In search of an ideal multimodal analgesic combination for abdominal surgeries, we conducted this study comparing analgesic efficacy of pregabalin alone with pregabalin along with ketamine when given preemptively. We found that the mean heart rate in Group P (pregabalin alone) was higher than Group PK (pregabalin + ketamine) at all intervals; statistically significant difference was found before induction (0.02), after surgical incision (0.0001), and after extubation (0.002). Similarly, the MBP in Group PK was found to be lower at all time intervals as compared to Group P. The MBP after surgical incision was found to be significantly lower in Group PK than Group P (P = 0.04). 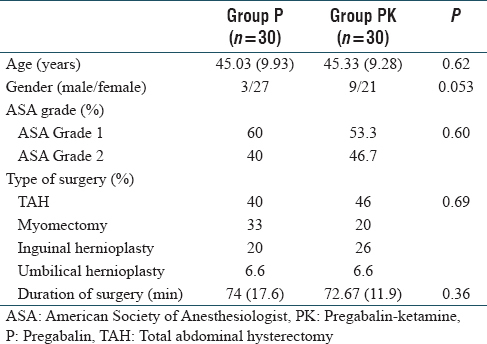 Hence, in our study, we found better hemodynamic stability when we used a combination of pregabalin and ketamine (Group PK) against pregabalin alone (Group P) in the intraoperative period. This difference may be explained by better analgesic effect of combination of pregabalin with ketamine as compared to pregabalin alone. Martinez et al. in a randomized, double-blind, controlled study compared the efficacy of pregabalin alone, ketamine alone, and their combination on postoperative pain when given preemptively. They found that the combination of pregabalin and ketamine in patients undergoing total hip arthroplasty did not provide when compared to pregabalin better pain control alone. The pain scores at rest and on movement were found to be similar in this study at all time intervals among both the groups. Our study corroborated with the results of Martinez et al., as the mean VAS scores at all time intervals postoperatively were not significantly different among Group P and Group PK. Although in our study it was observed that time to first analgesic demand was greater in pregabalin–ketamine combination group (Group PK) as compared to pregabalin-alone group (Group P), the difference was not statistically significant. Martinez et al. found that the mean (SD) total 48-h morphine use was reduced in the combined ketamine and pregabalin group (38(19) mg), as compared to ketamine-alone group (52(22) mg) and pregabalin-alone group (44(20) mg). Similarly, in our study, we found that that total postoperative analgesia requirement was significantly (P = 0.006) lower in pregabalin–ketamine combination group (Group PK, 41.8 ± 2.34 mg), as compared to pregabalin-alone group (Group P, 44.47 ± 5.06 mg). No statistically significant difference was found in side effects profile among the two groups. Limitation of our study was that the bioavailability of drugs used was not ascertained, and there can be a large variation of bioavailability of orally administered drugs. Furthermore, patient variability in pain threshold was not taken into consideration. Although our sample size was adequate, to make conclusive recommendations, larger multicenter trials to further evaluate the efficacy of opioid-sparing effect of pregabalin and ketamine when used as a combination in abdominal surgeries are warranted in the future. The combination of oral pregabalin and IV ketamine when given preemptively reduces opioid consumption in postoperative period in patients undergoing abdominal surgeries. Kehlet H. Postoperative opioid sparing to hasten recovery: What are the issues? Anesthesiology 2005;102:1083-5. Kehlet H, Dahl JB. The value of “multimodal” or “balanced analgesia” in postoperative pain treatment. Anesth Analg 1993;77:1048-56. White PF, Kehlet H, Neal JM, Schricker T, Carr DB, Carli F, et al. The role of the anesthesiologist in fast-track surgery: From multimodal analgesia to perioperative medical care. Anesth Analg 2007;104:1380-96. Dolin SJ, Cashman JN. Tolerability of acute postoperative pain management: Nausea, vomiting, sedation, pruritus, and urinary retention. Evidence from published data. Br J Anaesth 2005;95:584-91. Martinez V, Cymerman A, Ben Ammar S, Fiaud JF, Rapon C, Poindessous F, et al. The analgesic efficiency of combined pregabalin and ketamine for total hip arthroplasty: A randomised, double-blind, controlled study. Anaesthesia 2014;69:46-52. Shneker BF, McAuley JW. Pregabalin: A new neuromodulator with broad therapeutic indications. Ann Pharmacother 2005;39:2029-37. Chizh BA, Göhring M, Tröster A, Quartey GK, Schmelz M, Koppert W, et al. Effects of oral pregabalin and aprepitant on pain and central sensitization in the electrical hyperalgesia model in human volunteers. Br J Anaesth 2007;98:246-54. Roytblat L, Korotkoruchko A, Katz J, Glazer M, Greemberg L, Fisher A, et al. Postoperative pain: The effect of low-dose ketamine in addition to general anesthesia. Anesth Analg 1993;77:1161-5. Lin HQ, Jia DL. Effect of preemptive ketamine administration on postoperative visceral pain after gynecological laparoscopic surgery. J Huazhong Univ Sci Technolog Med Sci 2016;36:584-7.